Campaigners want greater protection for a wall commemorating the drowning of a Welsh village after it was vandalised for a third time this year. 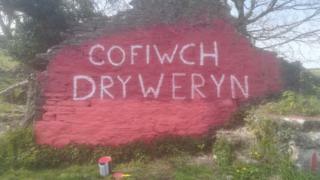 The "Cofiwch Dryweryn" - Remember Tryweryn - mural has been rebuilt by volunteers following the latest attack. The group kept watch of the "important national symbol" at Llanrhystud overnight on Saturday. It was widely regarded as a turning point in the Welsh nationalist and language movements, and witnessed Plaid Cymru securing its first MP in 1966. "People started to question our future as a people and our ability to defend ourselves and each other," Plaid Cymru AM Helen Mary Jones said. "That wall, when it was first painted in the 1960s was a cry of anger - a cry of despair." The main obstacle to protecting the wall has been that it is on private land. Ms Jones said talks were already under way between the Welsh Government and Ceredigion council about bringing the wall "into public ownership". "The damage upset and angered a lot of people," she said. "We don't want to build a steel or a barbed wire fence around it - but we could look at putting up a discreet security camera to deter vandalism." Jac Davies said he and a group of four friends travelled to the mural from Carmarthen in two cars after seeing pictures of the wall on social media. Along the way they spent £100 on supplies to repair the wall and were joined by two supporters who had travelled from Welshpool in Powys. "It was all over the lay-by and pretty much the whole top of 'Cofiwch' was all over the floor," he said. "You learn about it in school and about how much it means to Welsh people. Seeing it defaced was bad enough but seeing it come down is shocking."